Embroidery on ribbons - new book! 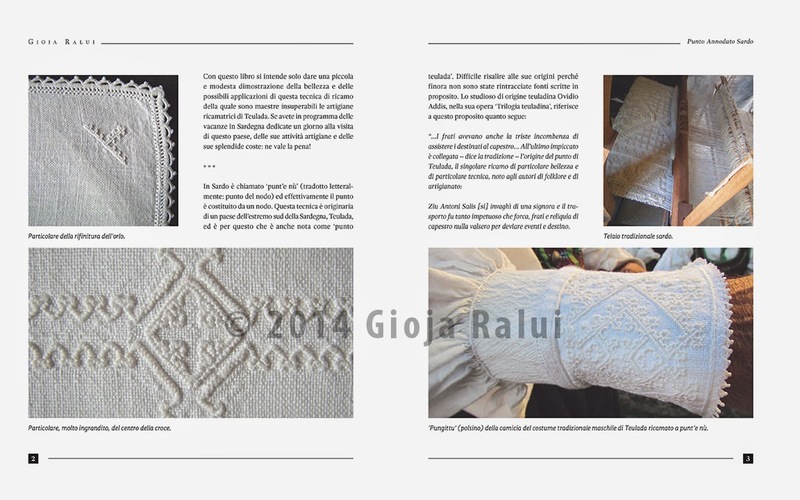 Sardinian Knotted Stitch - new book! Almost a year ago I was contacted by a lady from Sweden who is the grand-daughter of a lady named Elsa Peterson who started a lacemaking company in Vadstena in 1920. Today the company is run by the lady who contacted me's 90-year-old mother and she was interested in reproducing some old patterns so that they would not be lost. Well, back to our story. Some of Aurore Ingelotz's patterns were recovered from an attic and found their way into Elsa Peterson's possession. Here you can read (with the aid of Google Translator if you don't speak Swedish) the fascinating story of the research behind these patterns done by the lady who contacted me. 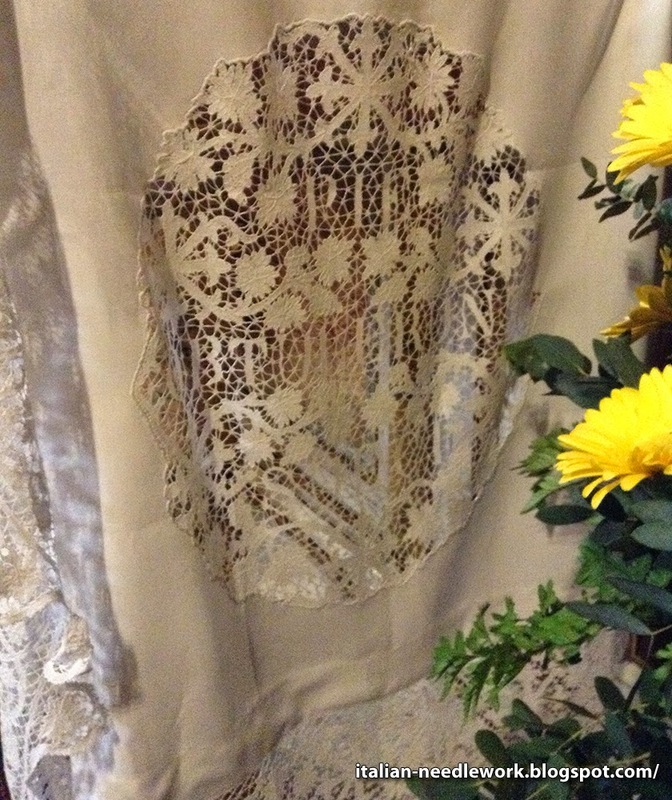 While doing her research, this lady was trying to find out if the lace altar cloth sent to Rome in 1895 still existed. We contacted Santa Brigida Church to find out that yes, it was still there and was used and exhibited once a year during the celebrations of the canonization of St. Bridget on October 7. 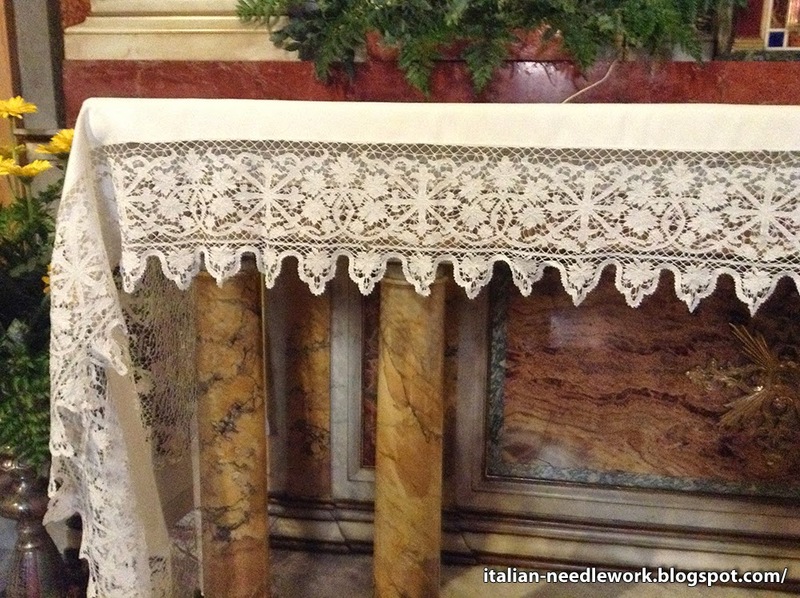 As I was going to be in Rome at the time, I offered to try to see if I could get some photos of the altar cloth or at the very least, go to see it for myself. The sisters of Santa Brigida also took some pictures in the meantime and when we visited they were very kind to let my friend and I have a few minutes after the ceremony alone at the altar to take a few photos. 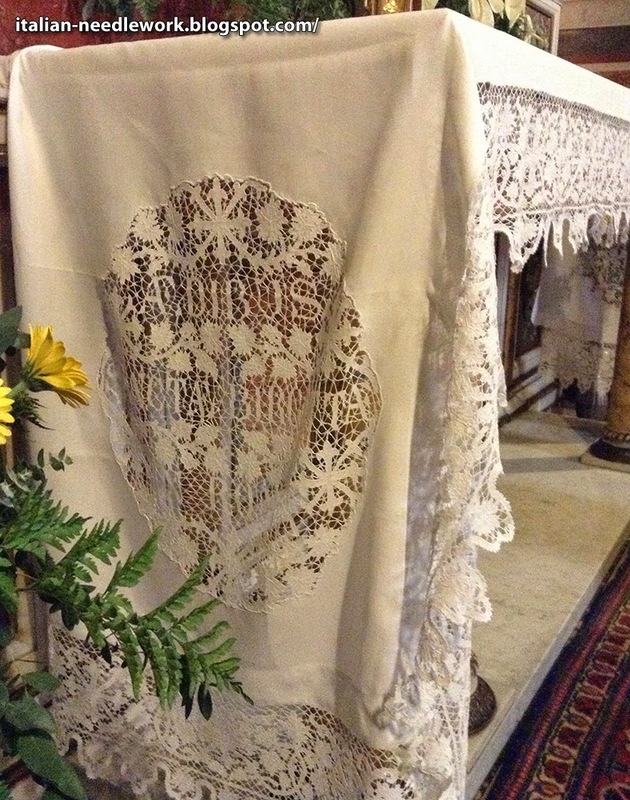 The altar cloth is 4.4 meters long and 1.3 meters wide, at each end there is a medallion (two different designs) and there is a lace border of 20 cm wide. You can see more about this altar cloth here. See the display of the patterns in the shop window here. Thank you very much Karin for letting us share in your adventure! 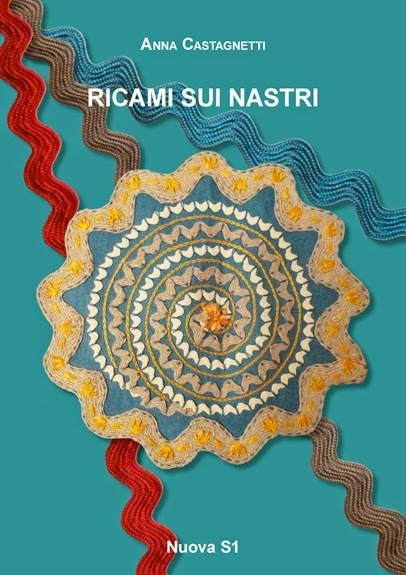 Anna Castagnetti from Verona has released her latest book: Ricami sui Nastri [Embroidery on Ribbons] through the ever-expanding "Lace and Embroidery" collection from Nuova S1 in Bologna. Anna is now the author of many Italian embroidery books and she shows no sign of slowing down or running out of cool ideas. Zigzag ribbons are very versatile: they can be found in many colours and in various widths and, being flat and of a compact weave, are perfect to apply to fabric and embroider on effortlessly. Starting with this simple ribbon the author offers many ideas with detailed instructions, accessible even to beginners, for decorating your creations. The zigzag ribbons, I know as Rickrack trim and there are other trimmings used like grosgrain ribbons and gorgeous velvet ribbons alongside coloured embroidery threads. Guest towel project from Ricami sui Nastri by Anna Castagnetti. The book is 64 pages and contains diagrams for a few decorative embroidery stitches used in the embellishment of the projects of which there are 14 of various complexity. Delightful guest towels, bags and purses, cushions and placemats which all serve to get your creative juices flowing and lead you to think of a million other things that you can apply these ideas to. It is chock-full of step-by-step large and close-up colour photos. 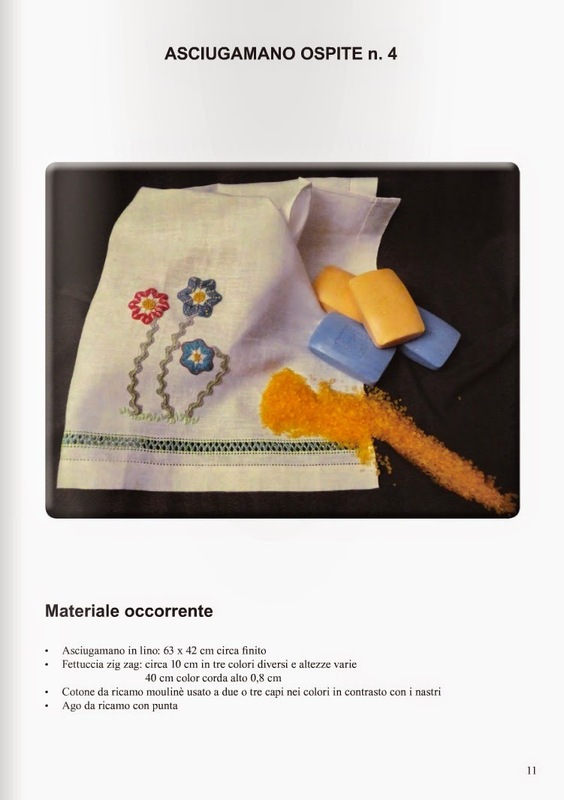 The text is in Italian but there is enough here in the way of diagrams, illustrations and photography to help you figure out what to do especially if you already have some sewing and/or embroidery experience. You can see a preview of a few pages here. Simple and quick but enough to personalize. I admire the way that Anna can always do these kinds of things that are just perfect for today's embroiderer who has less time than previous generations but who still wants to create with needle and thread. This book is available now and you can contact Anna through her website or Nuova S1 (I believe they take PayPal now). I can finally tell you about one of the projects that I've been working away on... for nearly the past four years! The result of intense study, research and lots and lots of blood, sweat and tears: Il Punto Annodato Sardo (Sardinian Knotted Stitch) is an instructional manual on the little-known needlework technique called Punt'e nù which comes from Teulada in southern Sardinia, a large Italian island off the western coast of Italy. This book is the collaborative effort of four stitchers who set out to learn more about this beautiful needlework found traditionally on men's folk costumes from Teulada. 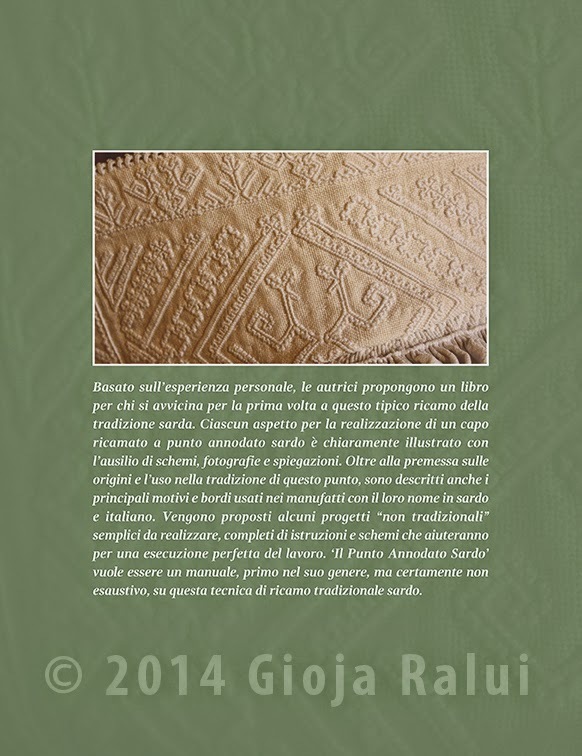 The back cover above shows a close-up of the richly embroidered collar and below you can see the cuff of a man's traditional folk costume shirt. The book is intended as a beginner's approach to the needlework. As Punt'e nù has traditionally been local to Teulada and handed down by word-of-mouth there is very little written about it. Even Sardinians who live outside of Teulada only get to see it in some museums or on the costumes during religious festivals or on the rare occasion of an artisan exhibition. There is a group in Teulada now who has been working to bring this and other embroidery typical of the area to light with needlework shows exhibiting non-traditional pieces adorned with Punt'e nù like towels, tablecloths and other household and personal linens. For more information about this group and/or visiting Teulada and seeing this work, contact the owner of this blog. 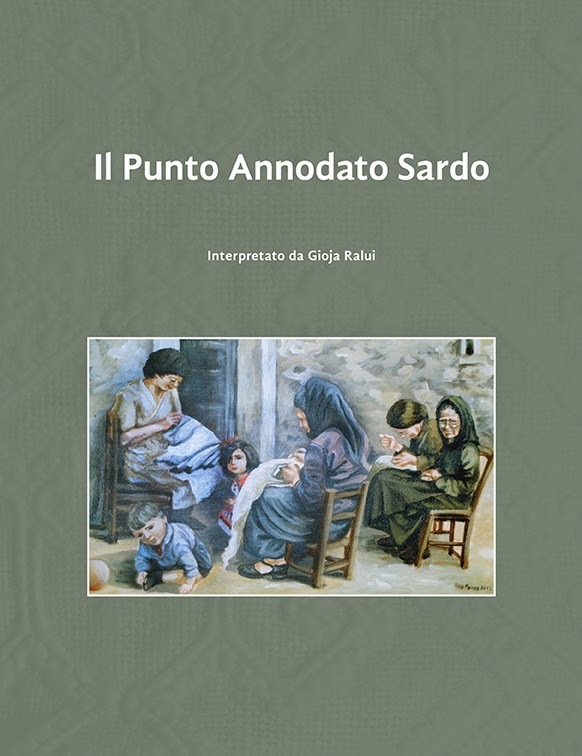 The book Il Punto Annodato Sardo is 70 pages and covers some historical background along with technical instructions, some traditional patterns and then a few non-traditional projects. It is available on amazon.it (and other amazon websites) but this first version is written in Italian. Very shortly there will be an English version and I'll keep you up-to-date when that is finished and available. I must get back to work! UPDATE: here is a review in Italian for those that would like it, and another one here. Also there are now quite a few reviews (in Italian) on the amazon.it website page for the book. UPDATE: the English version is now available!